It has happened to me on the Mississippi in a single, when a movement in the water catches my eye—a black swirl spinning away from me—and in that moment my heart seems to leap to my throat, as if some water creature might climb out of the depths to the surface. But soon I see it has a mate on the other side spinning away from my boat, and I recognize the pair as the puddles from my own stroke. I had that feeling again yesterday, though it wasn’t my swirls that jarred me. I was in a men’s quad for this late afternoon row, and the pace was unrelenting and solid. There was a good chop on the water, most likely from the new ferryboat unveiled by the BVG this spring, and it runs on the half hour and ruins your good water for quite a spell. Irregular waves splashed up the side of the boat, ricocheting off the riggers, and the water that struck my back, arms and legs was cold, though nothing like the cold of a Minnesota snowmelt. If there ever was such a thing as a sea monster, one must surely live in the Wannsee, I thought, as the gloom of twilight settled around us and the cold fingers of the lake reached up to lash us. Land framed us in all directions. It’s not a round lake by any means; it’s merely a widening of the Havel River, much like Lake Pepin in the Mississippi, but there are smaller lakes jutting off the sides leading to dead ends, and from our low sightline in the boat the land seems impossibly angled, so many inlets you could explore if you had a motor and the time. We’d had a pleasant enough row out to Cecilienhof, the mansion where Churchill, Truman, and Stalin carved up what remained of Germany after the war. We rested between that castle and an old brick dairy that finds its way onto maps of historic sites around the Wannsee. When we began to shiver we spun the boat around and began our nine kilometers back. But after we passed the Ruined Castle and reached the tip of Peacock Island and the Wannsee widened again, the chop grew worse, and Jan called for us to shorten our strokes to three-quarter slide. Tomas in three seat was struggling with his foot stretchers; the screws had fallen out on the left side and his shoes lifted off the hull of the boat with every stroke. We fought against the water and our backs strained with the effort and our pace felt stunted in the seemingly endless sea. 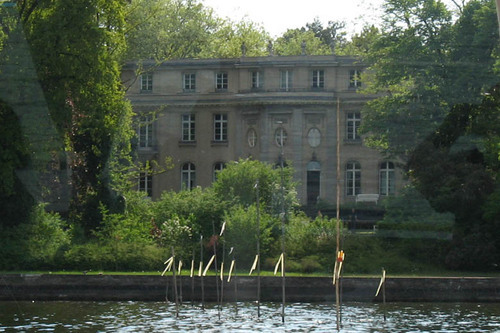 It was in this state of turmoil that I saw it: the Haus der Wannsee-Konferenz—the villa where members of the SS and war ministries met to plan the deportation and murder of the European Jews. I’d known it was over here somewhere, but had never managed to pick it out in the bright light of day. The sun could no longer be seen, though it had not yet set; a thick layer of clouds hid it from sight, and the lamps of the villa were lit against the dark. From the black water it positively glowed, some Gatsby wonderland, the site of such evil, such shame. We crossed the lake, as I knew we would; the Haus lies directly across the water from the rowing club. And when we reached the mouth of our docking area Jan called out “Ohne Kraft!”—no pressure—but though we dropped the power we approached the dock with too much speed and nearly cut our hands as we reached out to slow our arrival. No longer exerting myself, my wet clothes chilled me, and on the dock and on land I began to shiver visibly. While Tomas repaired his footstretchers in the dying light, I ran to get my coat to fend off the cool night air. I looked out across the water at the lights of the Haus der Wannsee-Konferenz twinkling in the distance, and I knew the time had come. The visits I’ve put off to the dark side of Berlin could be delayed no longer; with our departure set for July, time is running short, and the onion layers of history demand to be peeled back. Fortified with a dose of decency from the rowing community that surrounds me, I resolved to do my civic duty and see what evil men can do. This entry was posted in History and culture, Rowing and tagged Berlin, Cecilienhof, Churchill, Haus der Wannsee-Konferenz, Minnesota, Mississippi River, Rowing, sea monster, Stalin, Truman, Wannsee on April 2, 2014 by Jill M..